We are honored to be named 2017 “Best Sushi” in Gilbert by the East Valley Tribune! Thank you to all of our loyal customers who bring the whole family in for our fantastic sushi and signature martinis. Check out our entire menu of award-winning sushi and other bites here. What’s the perfect way to unwind after a long day? A stop in to Blue Wasabi Sushi & Martini Bar for our rockin’ Happy Hour from 4-6pm every Tuesday thru Saturday! 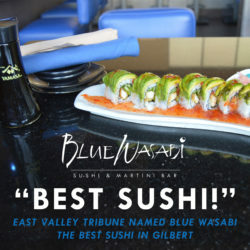 Get down to Blue Wasabi in Gilbert, sit down with a martini and enjoy a roll or two to fill your stomach without emptying your wallet! The Force is Strong at Blue Wasabi! It’s T-minus 15 days from the much anticipated release of Star Wars: The Force Awakens and we couldn’t be more excited! And because we know you love the series as much as we do, this month leading up to the release on December 18, we’re raffling off all kinds of Star Wars-themed awesomeness. For every item you order from our very clever “Skyy Walker” menu, you’ll receive a raffle ticket to win amazing prizes like original paintings of Yoda, Darth Vader and Chubaka, along with Star Wars prints, kitschy light saber chopsticks (you know you want some) and even tickets to see the movie! You’ll fight your father over the Yoda Roll, featuring deliciously tender tempura calamari, crab mix, cream cheese and avocado, and might even consider the Darkside when you try our Storm Trooper Martini, made with Skyy coconut vodka, Creme de Cacao, whipped cream and a crushed Oreo rim. The more items you order, the more tickets you receive! There’s no reason to be blue when Sunday rolls around and your weekend winds down. When you wear the color blue on any Sunday into Blue Wasabi, you’ll receive 50% off your alcoholic beverages throughout the day! 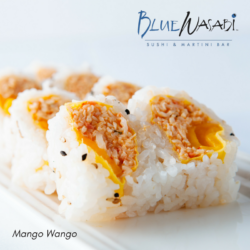 It’s time to look forward to Sunday – it’s the best day at Blue Wasabi! Let’s be honest though, who can visit Blue Wasabi and not indulge in our tantalizing cuisine? In honor of Blue Sunday, we’re running down the list of unforgettably delicious menu items that start with the letter “B.” Drum roll please! Berry White Martini – Start your night off with this blue, berry-flavored, brilliant concoction of Smirnoff Blueberry Vodka, blueberry-infused sweet and sour and white cranberry juice. Baby Back Ribs – For your first course, enjoy our succulent and tender baby back ribs that are slow cooked in an Asian rub, then glazed with an incredible bourbon and pineapple sauce. Badda Bing – Next, try a perfectly balanced vegetarian roll consisting of roasted bell peppers, asparagus, cream cheese and roasted garlic, topped with balsamic glaze. Butter My Roll – This roll includes one of our favorite “B” words: Butter. It’s so good it nearly melts in your mouth. This truly unique roll rolled combines snow crab and cucumber inside, and is topped with fresh salmon sashimi, ponzu, salt, and of course, clarified butter. Yum! Banana Nut Spring Roll – Be sure to save room for dessert! We take ripe bananas and roll them in crushed Macadamia nuts, then wrap them in a spring roll wrapper, and top ’em with ice cream, caramel, chocolate and whipped cream. Buttah Face – For those of you who would rather drink your dessert, the Buttah Face is just what you’re looking for. It’s a sweet blend of vanilla vodka, Butterscotch Schnapps, amaretto and vanilla cream. This drink is the perfect end to the perfect meal! For those of you who aren’t martini drinkers, feel free to enjoy 50% off any cocktail, beer or wine of your choice. However, if you’re having fun sticking to the “B” theme, then choose a Blue Moon, Bud Light, Belvedere on the rocks, or a glass of Borgo Magredo Prosecco every Blue Sunday at Blue Wasabi. It’s definitely the place to “B” on Sundays in San Tan. Celebrating 7 Years in SanTan! Join us tonight for one mother of sushi-loving good time, as we bring Vegas to Gilbert for Blue Wasabi’s 7-11 Anniversary Party! The celebration marks 11 years of Blue Wasabi serving up some of the best sushi in the Valley and 7 incredible years at San Tan Village! Take a spin at our roulette wheel to get in on the action, or order any item off our specially priced 7-11 Menu to earn raffle tickets for entry into exciting drawings held at 7:30, 8:15 and 9:00 p.m. Prizes include $50 and $100 Blue Wasabi gift cards, along with a not-to-be-missed $700 grand prize, featuring an in-home sushi party catered by a Blue Wasabi sushi chef for you and six of your closest friends. Blue Wasabi fans, be sure not to miss out – you must be present to win!